Many creative people are highly sensitive and may also be empathic. 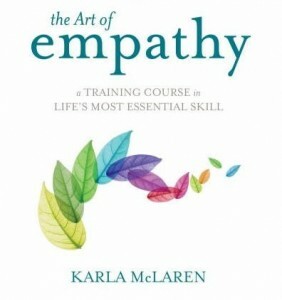 “Actors are specialists in empathy…” Karla McLaren, in her book The Art of Empathy. “I think I was born with a great awareness of my surroundings and an awareness of other people. Read more in post: Actors and High Sensitivity. McLaren writes, “In healthy and intentional empathy, these six aspects work together to help us understand others and make perceptive responses to their stated and unstated emotions, needs, and circumstances. From her article The difference between empathy and enmeshment. “What if there were a single skill that could directly and radically improve your relationships and your emotional life? Some of us are natural-born empaths—those with an exceptional gift for feeling and understanding the emotions, circumstances, and needs of others. But empathy, teaches Karla McLaren, is a universal human skill that we can all learn to awaken and use wisely. With The Art of Empathy, you will learn, step-by-step, the art of experiencing through the eyes and hearts of those around you—and to connect with and support them most effectively. The Art of Empathy program. “Empath Karla McLaren is an award-winning author, social science researcher, and pioneering educator whose empathic approach to emotions has taken her through the healing of her own childhood trauma, into a healing career, and now into the study of sociology, anthropology, neurology, cognitive psychology, and education. The Language of Emotions: What Your Feelings Are Trying to Tell You. The Art of Empathy: A Complete Guide to Life’s Most Essential Skill.